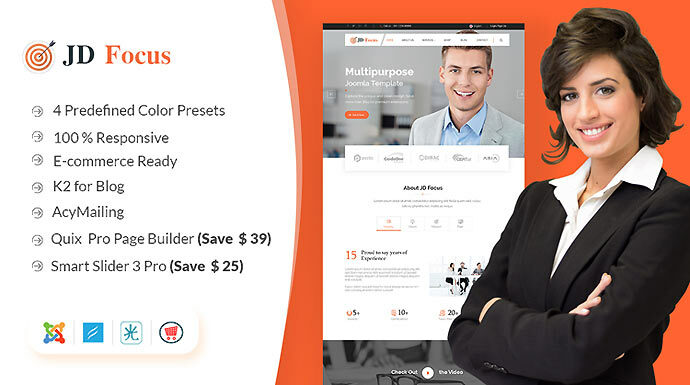 JD Focus - is awesome super cool, freemium multi-purpose Joomla 3.8X template for your startup, corporate or any ecommerce website. It is built to perfection. With this stunning Joomla template, you can showcase products in an elegant way. It is specially developed for those who want to develop an ecommerce website. JD Focus comes with J2Store and HikaShop, these are known to be the best online shopping extensions in the market. Both of these have wide range of settings which allows to display products cleverly. Besides these features, it is built with powerful Helix3 Framework. In addition to, JD Focus comes with predefined colour variations, bundle of layouts, Quix Page builder and much more. Try the demo, we guarantee you would not look further than this classic template.